COLORADO IS ONE of the Rocky Mountain states located in the west-central part of the UNITED STATES. All of Colorado is more than 3,300 ft (1,000 m) above sea level. With an average elevation of 6,800 ft (2,070 m), Colorado is the highest of all the states. Colorado is a Spanish word meaning “reddish colored” and was the name early Spanish explorers gave to the Colorado River when they first explored the region in the late 1500s. The state is bordered by WYOMING and NEBRASKA in the north, KANSAS and NEBRASKA in the east, NEW MEXICO and OKLAHOMA in the south, and UTAH in the west. In the southwestern corner of the state, four state boundaries come together (New Mexico, ARIZONA, Utah, and Colorado) forming what is known as the Four Corners. 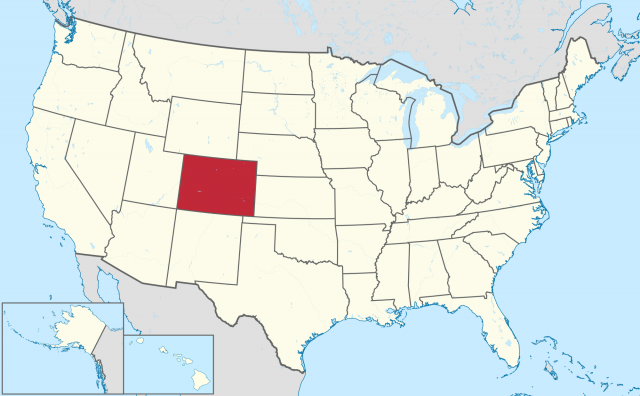 Colorado, like Wyoming, is rectangular in shape with a combined area of 104,100 square mi (269,837 square km), making it the eighth largest of the 50 states. Colorado has 4,301,261 residents, ranking 24th among the 50 states. With only 41 persons per square mi (106 per square km), the state ranks 37th in population density. The state’s 10 largest towns, all located in a 175-mi- (282-km-) long corridor along the Front Range from Fort Collins in the north to Pueblo in the south, account for 45 percent of the total population. Denver is the state’s largest city as well as the capital. The ROCKY MOUNTAINS, running from north to south through the middle two-fifths of the state, are the most dominant physical feature. In contrast, the eastern two-fifths of the state is part of the Great Plains, a relatively flat, treeless plain that extends from the mountains eastward to the Nebraska and Kansas state borders. To the west of the Rockies, the Colorado Plateau covers the remaining one-fifth of the land. In addition, Colorado includes small sections of two other natural regions, the Wyoming, or Green River, Basin and the Middle Rocky Mountains, both of which lie in the extreme northwestern part of the state. Colorado also straddles the Continental Divide, which separates rivers flowing to the PACIFIC OCEAN and the Gulf of Mexico. Lands west of the divide whose waters flow to the Pacific are referred to as the Western Slope, while those to the east with waters flowing to the ATLANTIC are referred to as the Eastern Slope. Five mountain ranges make up the Colorado Rocky Mountains: the Front Range, the Sangre de Cristo Mountains, the Park Range, the Sawatch Range, and the San Juan Mountains. The mountains are not part of a single highland area but are divided into two roughly parallel groups. The eastern mountain belt includes the Laramie Mountains, the Front Range, and part of the Sangre de Cristo Mountains. The highest peaks of these eastern ranges are Blanca Peak, Longs Peak, and Mount Evans, all of which are more than 14,250 ft (4,340 m) high. Pikes Peak, the state’s most famous landmark at the southern end of the Front Range, rises to 14,110 ft (4,301 m). The western belt of high mountains includes the Park Range, the Sawatch Range, and the San Juan Mountains. The Sawatch Range contains Mount Elbert, the state’s highest peak at 14,433 ft (4,399 m). The Sawatch Range and the San Juan Mountains combined contain 27 of the state’s mountains over 14,000 ft (4,250 m). Several broad, high-altitude valleys and mountain basins called parks separate the mountain belts from each other. The parks and valleys between the two mountain belts of the southern Rockies are broad, relatively flat, grass-covered areas. The principal ones are, from north to south, North Park, Middle Park, South Park, and the San Luis Valley. The Great Plains region covering the eastern twofifths of the state is a broad expanse of flat or rolling prairies that rise from about 4,000 ft (1,200 m) above sea level along the Kansas state line to approximately 7,000 ft (2,100 m) above sea level at the foot of the Rocky Mountains. The Great Plains region is not uniform throughout the state and is often divided into the High Plains, the Colorado Piedmont, and the Raton section. The High Plains are mostly level lands that extend along the eastern border with Kansas. The Colorado Piedmont, which lies to the west of the High Plains, is more varied in relief with low ridges, steep bluffs, flat-topped mesas, and conical hills referred to locally as called tepee buttes. The Raton section to the south of the Piedmont is more rugged, with numerous mesas and buttes of volcanic origin and narrow, rocky canyons that often appear out of nowhere. The plains region is primarily a dryland farming rea used for growing wheat and grazing cattle, although the use of irrigation has allowed an increase in corn and sorghum production in areas where groundwater is sufficient to support pumping. The Colorado Plateau occupies the western two-fifths of Colorado. Originally named by explorer John Wesley Powell, the plateau is in fact a huge basin ringed by highlands and filled with dozens of separate plateaus that range from about 5,000 to 11,000 ft (1,500 to 3,400 m) high. As a physiographic “province,” the region is geologically and topographically distinct from other parts of the west remaining structurally intact for the past 500 million years or more. Sprawling across southeastern Utah, northern Arizona, northwestern New Mexico, and western Colorado, the Colorado Plateau covers a land area of 130,000 square mi (336,700 square km). Of America’s 50 states, only ALASKA, TEXAS, CALIFORNIA, and MONTANA are larger. One of the plateau’s unique features in Colorado is the Black Canyon of the Gunnison, a deep gorge cut by the Gunnison River that is deeper than its more famous neighbor, the Grand Canyon, in places. Colorado’s earliest inhabitants were Native Americans who settled in the mesa country more than 2,000 years ago. The first European to enter the region was probably the Spanish conquistador Francisco Vásquez de Coronado in the 16th century, with Spain claiming the area in 1706. France also laid claim to the area as part of its Louisiana Territory, although no settlements were established. The United States bought the area north of the Arkansas River and east of the Rocky Mountains as part of the LOUISIANA PURCHASE in 1803. Early expeditions to the area explored routes opened earlier by the famous mountain men, trappers, and fur traders. While Bent’s Fort along the Arkansas River became one of the best-known trading posts in the region, settlement did not begin until the United States acquired the remainder of present-day Colorado from MEXICO in the Treaty of Guadalupe Hidalgo in 1848. It was the discovery of gold at Cherry Creek (present-day Denver) in 1858 that brought large numbers of settlers to Colorado. Interestingly, the area was part of the Kansas Territory at the time. Measures proposing statehood for Colorado were introduced in the U.S. Congress in 1864, although Congress did not pass the bill granting Colorado’s statehood until 1876. The mining booms of the late 1850s spurred Colorado’s initial growth. The state’s economy broadened when irrigated agriculture developed, and by the late 19th century, livestock raising had become dominant on the eastern plains. Early industrial growth was based on the processing of minerals and agricultural products. In the second half of the 20th century, the industrial and service sectors expanded as did winter resorts and summer recreational opportunities. Manufacturing is dominated by the processing of local raw materials and by technology-dependent light industries. Leading manufactures include the production of scientific instruments, food processing, and the making of industrial machinery. The brewing of beer is the leading employer among food-processing industries, although the state has a diverse selection of industries preparing and packaging Colorado’s farm output. Colorado is the nation’s fourth-largest producer of cattle. The sale of livestock and livestock products (mostly cattle and calves) accounted for 72 percent of farm income in 2002. Western Colorado is the leading sheepraising area in the state. The sheep are raised for both wool and meat, especially spring lambs. Hogs and dairy products contribute significantly to the state’s agricultural economy as well. Wheat is the leading cash crop, raised primarily on the High Plains. Corn is the second most important crop, although most of the corn is fed directly to livestock. In some plains areas, barley, grain sorghum, and oats are also grown, often in rotation with wheat. In addition, many stock farms raise both wheat and cattle. The production of fossil fuels is by far the most valuable resource extraction, representing four-fifths of the state’s mineral output and natural gas the leading individual mineral product. Most of this production takes place in the northwestern part of the state.